These vines will help you create a beautiful scene. 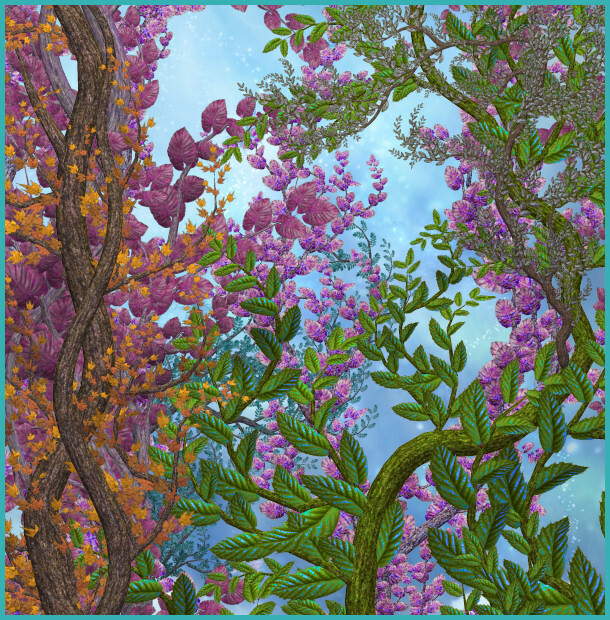 A package of thirty fabulous vine tubes that will give your fantasy designs the perfect touch. Use them to design backgrounds or to simply add a splash of color to your scene. These vine graphics come in a variety of hues from soothing greens and blues to scalding autumn shades and decadent plums. They’re a “must-have” for fairy, seasonal, and many other scenes. Drape them with butterflies and sparkling trails of fairy dust for the perfect fantasy scene. I use them all the time in my own designs. I created the background tile on this page for this page. It’s so nice that I’ve packaged it as I thought it might be great for making scrapbook papers, etc. It’s in the third zip file below. It’s 610 X 620 pixels. There are 31 royalty free, high-quality clip art PNG graphics in this package. All of these graphics have transparent backgrounds, making it easy for you to use them as tubes or nozzles–or merely to drop into your design. The size of these images varies but most are 1000 X 1500. All are 300 DPI, making them great for print projects. This package is three zip files which are about 1-25 MB each.